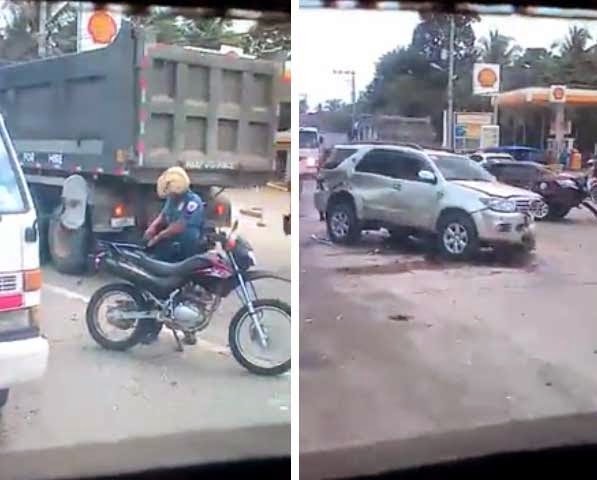 An accident involving a Toyota Fortuner and a dump truck caused heavy traffic Friday morning at the diversion road in Buhangin, Davao City. The video showing the heavily damaged sports utility vehicle was posted by Kristoffer Denosta on the Facebook page of ‎Davao City's Public Safety and Security CC/911/TMC Support Group. No other details regarding the vehicles were provided, but the uploader said the road mishap occured at an area going South right after the Buhangin underpass. Many motorists were reportedly complaining about the bumper to bumper traffic caused by the vehicular accident.